Other ingredients are deionized water, lecithin, potassium sorbate, phosphorus, sodium benzoate, glycerin, xanthan gum, artificial citrus flavoring derived from corn. "Researchers and physicians all over the globe are singing the praises of GSH — loud and long. And, it’s no wonder. Every cell in the body needs GSH and most actually make it. They have also determined that physical and emotional stress, pathogens, toxins, free-radicals and aging produce GSH deficiencies. Now, research confirms that boosting blood and intracellular levels of GSH provides a myriad of health-protecting and heath-promoting benefits for the brain, the heart, blood, eyes, liver, kidneys, pancreas, joints and overall energy levels. - neutralize free-radicals and help repair the damage they do. - help fuel and energize the immune system. - support transport of amino acids across cell membranes. 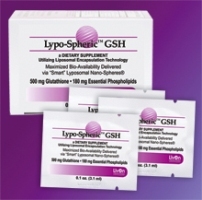 With Lypo-Spheric™ GSH you know you are ingesting 500 mg of reduced (the active form) glutathione sulfhydryl that will be delivered intact to the bloodstream and available for immediate action wherever your body may need it. * Fact: there’s no better way to supplement with GSH!" Do not use if pregnant or nursing without consulting a medical practitioner. Take one to two packets per day for boosting the immune system and maintaining cardiovascular, hepatic, and glandular health. For best results, ship or tear the corner off the packet, squeeze into your favorite cool beverage and drink on an empty stomach..
Take the power plant of your cells in for an overhaul.